As a young man, I was heading toward a new facet. My circle of friends had changed from one day to the other and my life as a young artist was developing rapidly. Music was slowly entering my life to change it for good. I was 14 years old when I approached my high school music department in search of lessons. Not for violin though, I wanted to be an electric guitar professional—whatever that could mean. The teacher told me that at the moment he was not offering guitar lessons—his new idea was to start a symphony orchestra for the town’s new fine art center. I mean, symphonic music is supposed to be for old people right? Unlike the electric guitar—now that’s cool. Most of my friends were enrolled in some kind of music program so I decided to join the new orchestra. VIOLIN! That I knew. Or at least I thought I knew. To be realistic, I had really no idea what I was getting myself into. I experienced real music for the first time. Using the All for Strings method I grew quickly. Soon I was spending my whole breaks in the music room. I made lots of friends and the feeling of family was growing among all of us. Later on, I met these two guys who later became my quartet members/best friends (teacher was the cellist). Surprisingly, the idea of boring music for old people was now fading. Four voices in complete harmony, one after the other created for me what it seemed like magic. WOW, what a nice feeling to be part of it. No matter if you messed up, finding each other was an adventure—and if you made it ‘til the end of the piece you were some kind of hero. Violin made everything different. It was changing my life completely. Before, I was considered an “average guy” and my grades sucked, my friends (old ones) were contaminating my life—my future didn’t seem so brilliant. Now, out of the blue, music was turning everything the other way around. I was now considered successful among classmates, teachers and faculty. Classical music was really fun but I was not completely convinced. Not yet. The guitar was still echoing around my head. The image of playing in a band overflowed my heart too much. I had to do that. It was not until I heard myself in the middle of a symphony orchestra creating awesomeness that I decided it was for me. After a few rehearsals with the school orchestra I knew what I wanted to do for the rest of my life. I wanted to make a living playing orchestral music. That was it. I decided I had to join the national symphony orchestra (P.R.) as soon as possible. The bad influences were staying behind and my new friends were 100 % geeks—and I mean straight A’s nerds. I was not used to that. My old friends smoked and did bad things while my new ones talked about science and Pokémon. Even though I was not hanging out at the usual meeting place, I felt better with myself. This nerds played quartet music with me and getting to know them made me want to spend more time with them. They were not as bad as they looked. Or maybe I was slowly turning into one of them, who knows! J. Together we went to my first music festival. Two weeks appreciating the real classical music world made me want it even more. I was ambitious. For the first time in my life I was willing to work hard on something to be good at it. By the time we returned to our town I had tasted a little bit of what seemed like the perfect world to me. The violin gave me a purpose. I wanted to live among those musicians who practiced their asses off to be good at the only thing it seemed I was good for, performing. Work was not work anymore. Work = fulfilling my heart with something I really wanted to achieve. After the festival we were all hooked with the quartet. We performed together in public places and became really well known around the high school community. Seriously, I was about to fail some courses the year before but that year I had a point average of 3.88. What was different? my friends and the violin. If you didn’t know it, your friends make a huge impact on your life and I am the living proof to tell you about it. There was one problem though, not for me but for me two buddies. According to society they were too smart to major in music. 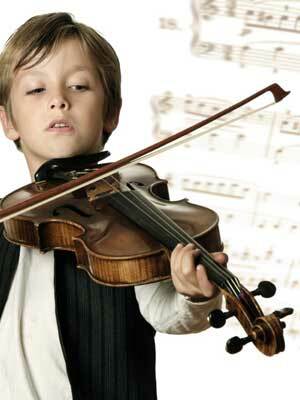 You see, were I come from nobody makes a living playing the violin, or with music at all. That seemed too far away from reality. You have to be a celebrity or something like that to make it happen in music. Even the teachers will wash your brain toward becoming a doctor or an engineer. “Music is not for you (my friend) your average point is to good. Music is for someone like Cesar whose point average is lower”. In my face, no hesitation, just like that. The guy was perfect pitch and could’ve been a hell of a composer. After high school we all took our separate ways. Yep! The nerds went to do scientific work and I went to the national conservatory. Since then, we have been around the world doing what we do best. I do music and they do science and philosophy. The get published and I get to play with orchestras the best music ever written. Oh, and I also have a blog. I guess I owe my luck to “not being good enough to be a doctor”. I am grateful I had bad grades [sorry mom]. The truth is, I can only look back and say “I would not change anything nor will I like to be in anybody’s shoes at this moment. My shoes fit well.” Unlike my best friends, I can say I was sent to this world with only one purpose; to be a violinist. Awesome. I myself played violin from age 8 and in the 90s it wasn't the coolest thing to do. With the Seattle sound in full force i was tempted to play guitar and i started at age 13. I continued to play violin until I graduated high school, and then went away to college and didn't even touch a violin until this summer nearly 11 years later. After working in a field I hated for five years I have now decided at age 29 to go back for a second undergrad in music. The good news is I have a 100 general education credits so a four year music degree will be less strenuous cause I will be able to focus strictly on music and my part time job. Thanks for sharing your story. Great article. thanks for sharing your story. I have had so many young male students quit cuz it wasn't cool. They would have been good also.